My friend Becky loves to get delivery from this place. I think nearly every time I’ve come over to her apartment for dinner, this is where we have ordered from. They’re fast, you can order online (great for people like me who hate talking on the phone!) and the food is pretty good as far as delivery food goes. The veggie burger on the menu is described as a “boca burger made with organic soy with organic blue cheese and organic pickles”. 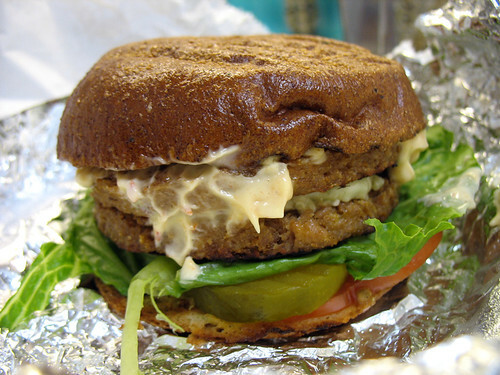 They aren’t just using the name “boca burger” to describe any old veggie patty, either – it is actually a boca burger. Like the kind I have in my freezer. Two of them actually, stacked together with the other toppings between two halves of a bun. It’s always a bit disappointing when a restaurant uses pre-made patties for its burgers – especially when you can identify them as ones you can buy yourself for a fraction of the cost. But, that would defeat the point of ordering delivery… right? To their credit though, Organique does a good job of spicing up a familiar frozen burger patty with interesting toppings (not quite as good a job as Foodswings, but...). The pickles, blue cheese (not vegan), and spicy mayo make it quite tasty, and the whole thing is rather satisfying – and filling! Two burger patties is a lot of food! I realize that I’m biased as a rather frugal girl who thoroughly enjoys cooking anything in her own kitchen… I confess, I hardly ever order delivery when I’m at home by myself. Yet I can imagine how, if I didn’t have a dozen veggie burgers in my freezer at all times (I do… thanks, Costco!) and I was feeling too tired to cook something from scratch, ordering from a place like Organique would be rather appealing. And how many delivery places serve all-organic food, anyway?